This New Moon brings in the cycle of the Planting Moon! Like watching spring unfold around us, our own seeds are beginning to bloom! We begin to see the tangible results of our planted seeds and intentions. The fire has been ignited! The Planting Moon cycle mixed with the Aries New Moon energy brings us a time of production, preparation, change, and creative energy. How do you want this new cycle to unfold? What steps will you take to help cultivate and nurture these newly sprouted seeds? Allow your actions and intentions to take off with this exciting energy. The seed has sprouted and new life is beginning to flow. We start this lunar cycle with a New Moon in Aries, a powerful time to make intentions for further growth. Towards the middle of the month we will experience the First Quarter moon in her home of Cancer, followed by The Full Moon in Scorpio on the 22nd. Last Quarter moon in Aquarius will finish this cycle leaving us feeling regrouped and refreshed after the cycle's exciting start. So grab a cup of tea and see what is in store for this new Lunar Cycle! This New Moon is a powerful time for setting intentions and recognizing our infinite potential. Use the energy of Aries to help your seeds gain momentum. The energy is expanding and you may be feeling scattered and overwhelmed at this time. The Fire element of Aries asks us to focus our time and our energy, to keep our eyes on the prize of what we want to create in our future. Use this lunar energy to fuel your intentions. You can expect new and exciting energy and opportunities to meet you at this time! During this fiery energy, you may notice that communications may be challenging. Anger, aggression and miscommunication may come to the surface for many of our relationships. It may be best to hold your tongue until after this new moon phase. Allow any relationships or habits that no longer serve you to fade away.This New Moon is the perfect time to release, detach and prepare for what lies ahead. The card pulled for this phase is the Waxing Gibbous phase of Movement. This is another fire aspect we are dealing with that is teaching you about your own unique expression of spirit. The universe loves action and movement. Get up and move your body to further your intention to Spirit. Embody your power and your passion. The rhythm of your soul dance is uniquely yours, surrender to your own flow. Crystal Allies: Smokey Quartz is a root chakra stone that enhances survival instincts. This stone can help one reach their personal goals, by grounding into their true essence. This stones brings abundance, luck and prosperity. Red Jasper, a stone of balance and fairness. This stone can help you regulate the fiery energy at hand and use it to your advantage.Garnet is a stone of rejuvenation and revitalization. This stone can help you tap into your true power and boost your energy levels. The moon returns to her natural home of Cancer during the Waxing Moon phase this month. Lady Luna is most at home in this watery emotional sign, you might find yourself wanting to stay home yourself! You may notice increased emotions and vulnerability during this time. Under a cancer moon, we tend to experience mood swings or heightened emotions. You might find yourself wanting more time for yourself, so listen and treat yourself to a bubble bath and a night in! Now is the perfect time for self care and self nurturing. Take the time to nest and cleanse your home as well. It's the perfect time to retreat, reflect and refill the will. The card pulled for this phase is the Waning Gibbous: Dream. The dream realm is the portal to the subconscious. Notice any shifts in your dreams around this time. As the moon grows in the sky, our connection to our subconscious will also experience changes. What is your inner soul trying to tell you through your dreams and visions at this time? Crystal allies: Moonstone enhances and balances the feminine energy in each of us. Moonstone can help us in times of chaos see the truth behind any illusions. This stone has a peaceful and calming energy that can help you navigate through these watery times with grace. Ocean Jasper reminds you to breath and reconnect. This watery stone reminds us of our interconnectivity with nature and all life on mother earth. This stone is very peaceful and brings with it a calming acceptance. Full Moon in Scorpio:The Shaman. This full moon lies just 2º in Scorpio. The full moon is a time of heightened emotion and increased lunar energy. Combined with the deep dark sign of Scorpio, this Full Moon will be hard to ignore! With many planets retrograde during this time, the energy may feel very dark and heavy. This is the second moon ruled by Mars this cycle, and with Mars being retrograde this Full Moon can feel very much like a battleground. Now is the time to strengthen your inner psychic warrior. The Scorpio influence will have you focusing on your inner shaman. Allow yourself to have a deeper understanding of the Life-Death-Life cycle that is presented to you each month.. it is especially relevant at this time! Something of importance may be brought to the surface, allow your innate deep wisdom to guide you in the decision between death and rebirth. The card drawn for this phase is Waxing Gibbous: Strength. You are growing stronger in your actions, so keep your eyes on the prize. If you are moving through trials or obstacles, know that this test will strengthen your will and fortitude.Strength demands discipline of the mind, body and spirit. Now is the time to focus on what you want to build. Be consistent and disciplined in all areas of your life. Crystal allies: Labradorite known as the magician's stone will help you wake up your inner magician. This is the stone of transformation and magic. Labradorite will bring you clarity in times of chaos. Moonstone is a stone of peace and love. This stone can help you feel calm during times of stress and anxiety. This stone connects you with the divine feminine, where deep knowledge of wisdom and magic are stored. The moon's light is beginning to shrink in the night sky and we may find ourselves turning inward during this last quarter moon in Aquarius. We may be having a hard time focusing on the now, with the moon half light and half dark, our minds may be stuck in both the past and the present. Use this Aquarius energy to check in with yourself and your tribe. Under this moon's energy we feel the need to be seen by those who know us most. This is a good time for socializing and being with our people. While the moon is waning back to new, this is still a powerful time for envisioning and planning for the lunar month ahead. Gather together what inspires your vision and hold the dream in your heart. Begin to make preparations for new seeds, and what you want to grow in the future. The card pulled for this phase is the Waxing Crescent: Play Childlike and creative play is one of the best things we can do for our goals. Invoke your inner child and allow her to have a say in this envisioning process. When we honor our inner child, the world will feel less heavy. You will naturally be pulled to follow your bliss, and envision your soul's highest desires. Crystal allies: Amethyst is a meditative and calming stone that works with our crown and third eye chakra. Use this stone to meditate and envision your soul's desire. Amethyst is a wonderful "all-purpose" stone that enhances and increases intuition. Turquoise is a powerful stone of connection. This stone was sacred to the Native Americans as it represents bridging the sky energy to earth. Turquoise is known as a master healer, and can assist in speeding up the process of healing and transformation. 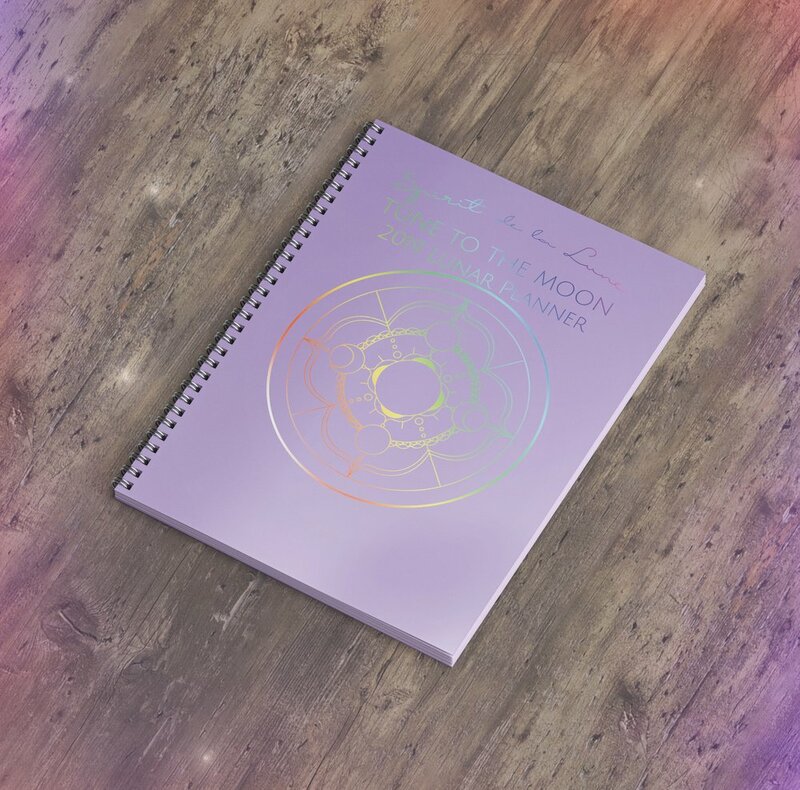 If you have the Spirit de La Lune deck, don't forget to try the Planting Moon spread in the guidebook! Be sure to use the hashtag#spiritdelalune so we can see your readings! Leave out you deck to charge under the tonight's powerful New Moon, and be sure to check back this Full Moon for a Planting Moon Ritual! We have some exciting news. . 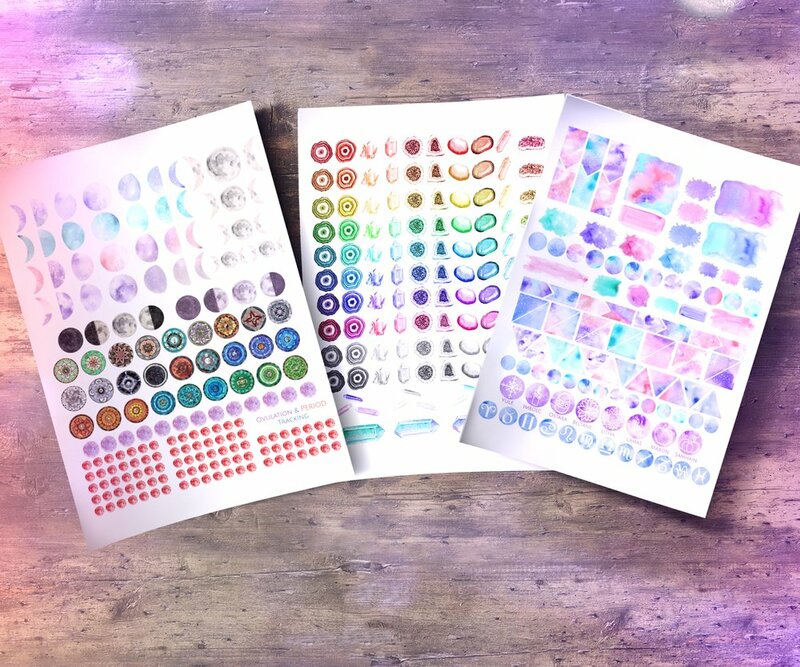 The Art Print Shop is officially open! We are very excited to announce the new Print Shop is open! Moondalas, Moon Phases, and Zodiac Mandalas make the perfect addition to your altar space, mystic room or living spaces! These art prints are of excellent quality and make the perfect gift for any astrology lover, as well as yourself!